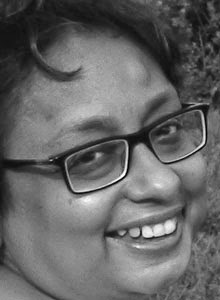 AUTHOR (Bio from Indireads): M.M. George is the pen name of Mimmy Jain. Mimmy lives in London and edits stuffy academic books and journals when she is not dreaming up frothy romances. Mimmy has been writing as far back as she can remember. She won her first national award for writing in the International Year of the Child, at the tender age of 14. She had her first romantic story published around the same time in a national magazine. For many years, she wrote a humor column, which was published under various names in India Week, The Financial Express and National Review. As Mimmy Jain, she has been a mainstream Indian journalist for the last 27 years and has worked in senior positions at publications such as The Economic Times,The Times of India, The Financial Express and Mint. 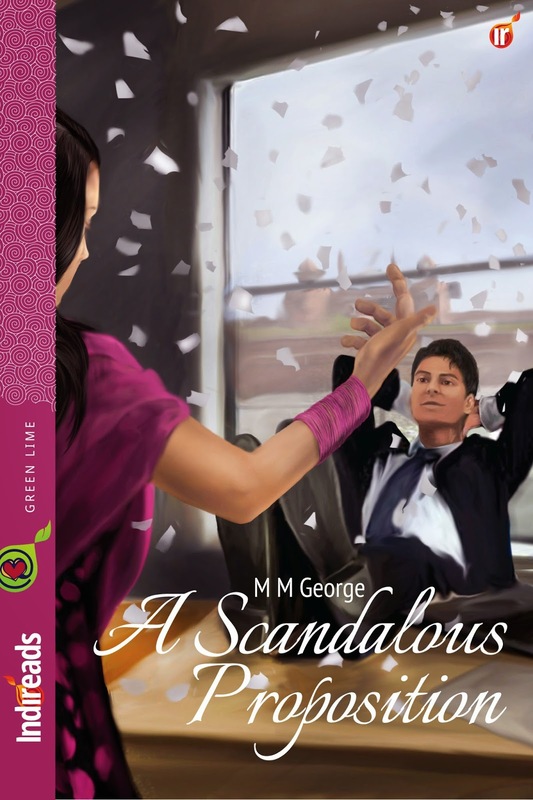 BOOK(S): A Scandalous Proposition is her debut e-novel. mature into something more substantial? She blushed and tried to bring her hand down, but her dupatta was caught in her earring. She pulled at it impatiently, but it refused to budge. She was just about to tear it away recklessly, when she heard the scrape of a chair and then felt his warm breath on her neck as a long finger extricated the flimsy material from the little bell in her ear. She closed her eyes to quell the thudding that started suddenly in her heart. MSM Speaks: Ah! After a long time, I read a book of this genre, Chick-lit that is. And let's just say "A Scandalous Proposition" is a fantastic mixture of Fifty Shades of Grey, Ekta Kapoor's Family Saga and some invisible background Hindi music. I mean this in a good way, don't be judgmental, you! It is a tiny package of handful of pages and works like a charm. Mira comes to New Delhi to find a job with her mother and younger sister, Reema and finds herself in a sticky position hard enough to extricate herself from. Unpredictably, she does find a way out of it, only to land in another hot boiling soup cooked by Mr. Ranbir Dewan - touted to be the hottest bachelor, who is also a heart breaker. But he cannot ignore Mira, the one who wears shimmering earrings and bangles that would irritate the hell out of him, but also fill his silence with music. He finds himself irresistibly attracted to her and despite her initial apprehensiveness and hostility, she reciprocates like dew drops, not in earnest. Not all is birds and bees with them though, mind you! They have very real issues to deal with, their sister and brother respectively who have got themselves into trouble, together. Now it is on these seemingly polar magnets to reconcile the situation and work their way around the scandalous proposition which Ranbir gives to Mira, who like any dignified woman, declined. But somewhere deep down her heart, she finds herself imagining the forbidden prospect. Ranbir's and Mira's journey beyond the physical attraction is worth a read. Totally mazedar read!!!!! MSM Recommends! !